Premature deterioration of reinforced concrete structures is a serious problem worldwide due to corrosion of the embedded steel. The affected reinforced concrete structures are mainly those which are situated in an aggressive marine environment, and road bridges to which de-icing salts are applied during winter periods. Corrosion of the steel is initiated when the chloride ion from the salt (sodium chloride) permeates through the concrete to the level of the reinforcement steel which is attacked on contact. The solution, now favoured by highways authorities in Europe and North America, is to use stainless steel for rebars that has proven to be highly resistant to chloride ion. Stainless steel reinforcement bars or simply called stainless steel rebars are more expensive than carbon steel rebars. They do not corrode for the design life of the structure which is normally taken as 125 years in the case of highway bridges. The reductions on ongoing repair and maintenance costs that are usually incurred in case of carbon steel rebars are significant. Environmentally, the reduced downtime for maintenance and repair impacts upon traffic flow and disruption thus making the use of stainless steel rebars highly attractive. Only a small percentage of the steel rebars needs to be stainless steel to achieve a significant increase in durability. Stainless steel rebars can readily be used with conventional carbon steel rebars in reinforced concrete without causing galvanic effects. Stainless steel rebars are cost effective when used in the elements of the concrete structure at highest risk to corrosion (with carbon steel used for the balance of the reinforcement) or, where repair is difficult and expensive. Further by using stainless steel rebars, the concrete mix can also be simplified as it not necessary to provide passivity to the steel for corrosion protection. There are several grades of stainless steel available for rebars. The choice enables cost effective usage for specific applications. Stainless steel rebars are stronger than the carbon steel rebars and are currently being produced as per British, North American and European national standards in diameters with sizes ranging from 3 mm to 50 mm. Tests on stainless steel for use in rebars were originated in the 1970s with work on stainless steels of 304 and 316 grades. In some of this work 316 grade stainless steel was partly embedded in concrete, exposed to stagnant, and to flowing seawater for 12.5 years. No corrosion was observed when the concrete was removed. Carbon steel samples exhibited corrosion and lost strength. Studies are also reported where 302, 315 and 316 grades stainless steel were contained in pre cracked beams. After 10 and 20 years, these austenitic stainless steels did not reveal any cracking. Carbon steel samples cracked after six months of exposure. Chromium – Around 11.5 % chromium is needed for a stable, passive, chromium oxide film to form and thus make the steel ‘stainless’. Chromium up to 26 %, along with molybdenum and nitrogen, increases corrosion resistance to initiation of pitting and crevice corrosion. Nitrogen – It enhances pitting/crevice corrosion resistance particularly in combination with chromium and molybdenum and increases strength of the steel. Various properties of stainless steel rebars are given below. Yield strength – The yield strength which is the load necessary to deform a material using 0.2 % offset, is typically 415 MPa minimum, for carbon steel rebars. This is easily met with 10 % cold worked stainless steel and is exceeded with the duplex alloy. Cold working stainless steels to higher levels raises the tensile strength and in the case of the yield strength to 1,380 MPa if requiredElongation -Cold worked carbon steel possesses an elongation of about 25 %. The duplex stainless steel is equally ductile, while the other stainless steels exhibit improved ductility up to 40 % in the annealed condition. Hardness- It is the resistance of a metal to indentation, scratching, abrasion, or cutting and is associated with strength, wearability and resistance to erosion. The 300 series stainless steel rebars compare favorably with carbon steel rebars in this regard. Duplex stainless steel exceeds the value for carbon steel and thus improves on this feature. Coefficient of thermal expansion (CTE) – The value for this property expresses the fractional increase, or decrease in length, compared to the original length, as the temperature increases or decreases respectively. The 300 series stainless steel rebars have CTE value about 50 % higher than the carbon steel rebars. However, the duplex steel’s CTE value very closely approximates that of carbon steel. Modulus of elasticity – This characteristic is a measure of stiffness, or rigidity of a steel helping to define its deflection, or bending, in use. Duplex and 300 series stainless steel rebars have modulus of elasticity values in the region of 190,000 and 200,000 MPa respectively while carbon steel rebars have this value in the region of 205,000 MPa. Magnetic characteristic -The 300 series stainless steel rebars are nonmagnetic. Grade 304 rebars can change a portion of its structure to a magnetic phase during cold work. If this is a problem then grade 316 rebars is preferred to prevent the magnetization from taking place. Duplex stainless steel and carbon steel rebars are magnetic. Formability –Both stainlesssteel and carbon steel rebars can be formed with the same relative ease. Corrosion resistance -Oxide on carbon steel rebar in the form of rust needs about seven times greater volume than the original rebar. As rust forms it places pressure on the concrete leading to cracking or complete loss of the concrete as spalling. In many cases costly repairs are required after a decade or two. The presence of chloride from road salt to remove ice or in a marine environment accelerates corrosion of carbon steel rebar. General corrosion resistance of stainless steel rebar employed in concrete is very good. An oxide forms on the stainless steel rebar is thin and protective. If the oxide is removed during installation, it reforms immediately. No pressure is exerted by this oxide on the concrete such as is found with carbon steel and rust. Pitting due to chloride from salt – Pitting resistant equivalent number (PREN) is calculated to give a relative pitting indication. PREN increases with the chromium, molybdenum and nitrogen content in a nickel containing stainless steel rebar. Duplex stainless steel rebar exhibits the best resistance to the penetrating effect of the salt chloride ion. If the threat of pitting is reduced through the improved stainless steel selection, this helps offset the threat of decreased fatigue resistance also as there is no pit stress riser. Carbon steel rebar has no inherent pitting resistance, and hence general corrosion (rust formation) and stress risers are always a problem. Cost comparison – The cost ratio for the stainless steel rebars illustrate that for strength, corrosion resistance to pitting and crevice corrosion, stainless steel rebar is cost effective. Duplex steel rebar is the most cost effective. Concrete inhibitors -Concrete inhibitors, employed in carbon steel rebar concrete structures represent an additional cost. Stainless steel rebars donot require an inhibitor. Water membrane – If a membrane is used for carbon steel rebar concrete structures, the preparation, smoothing and application of the membrane take time and additional cost besides temperature control is needed for the setting of concrete. With stainless steel rebars membranes are not required. Stress corrosion cracking – Work that has been done at the National Research Council, Canada during 1998 shows the chloride induced corrosion behaviour of pre-stressed stainless steel rebar in chloride contaminated concrete. Here, carbon steel, stainless steel of grades 240, 304, 316, and 318 were used. The concrete mix was cement / sand / aggregate in the of 1:2:3 by mass. Cement was type 10 Portland used for all samples with a water cement ratio of 0.50. Samples were cured at 250 deg C and 100 % relative humidity (RH) for 28 days before being placed in the test environment. To simulate construction practice, unbent samples (bend radius 4 times bar diameter) were employed. Chloride levels of 0 %, 0.5 % and 2 % in the test environment were kept. Carbon steel rebars embedded in concrete cracked in 4 months. No cracking of the concrete has occurred with embedded stainless steel rebars after two years and no corrosion of the U-bent reinforcing bar was observed. Some samples were placed in an environmental chamber with a RH of 80 % and temperature cycles between 250 deg C and 650 deg C. Test results show that carbon steel embedded in concrete with 2 % chloride cracked in 4 months. No cracking of concrete or corrosion has occurred with embedded U-bent stainless steel rebar samples after two years. Galvanic corrosion – Where a combination of carbon steel rebar and stainless steel rebar is specified for a concrete structure there has been considerable interest in the galvanic coupling of dissimilar materials. If the two materials are in contact in air then there is concern for corrosion. In concrete tests, It has been shown that the corrosion potentials of carbon and stainless steel rebars are practically identical. If the surface area of the carbon steel is large compared to stainless steel the effect is insignificant. Use of high strength, corrosion resistant stainless steel rebar for concrete reinforcement in bridges, highways, buildings and other construction projects has been on the rise recently – especially when the life cycle costs of this material upgrade are appropriately weighed against the initially lower costs and perceived savings of carbon steel. The trend to stainless has been particularly evident in coastal areas. Selection of stainless steel for rebars is based upon its corrosion resistance, strength, and long life. When selected, the overall increase in project installed costs, depending on project complexity, ranges from 1 % to 15 %. 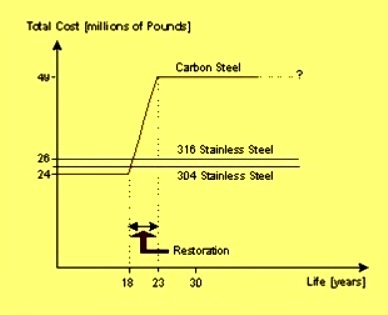 When life cycle costs (LCC) are calculated using stainless steel rebars and design life figures of up to 125 years is taken then the stainless steel rebars become very cost effective since they eliminate a number of the repair works associated with the reinforced structures with carbon steel rebars. Many structure designers are now employing LCC in their calculations. Critical performance requirements such as durability to resist the effect of atmospheric corrosion and de-icing salts over the life of the structure, structural integrity to be maintained for the full design life and minimal maintenance must be met. Stainless steel rebar increases the overall project cost 1 % to 15 % depending on complexity of the structure. Although initial costs are important, life cycle cost calculations are necessary to reflect cost comparison of a concrete structure. Stainless steel rebars cost lines are expected to remain flat, indicating no additional cost for 125 years. By comparison, it is anticipated that a concrete structure with carbon steel will need restoration in about 18-23 years. Life cycle cost calculations for the Schaffhausen Bridge crossing the Rhine River in Switzerland shows that with all the performance requirements to be met for 80 years and with the application of stainless steel grade 304 rebar, the LCC calculations employed show that for the three materials (carbon steel, epoxy coated steel, and stainless steel) studied, structural costs with stainless steel rebar were about 14 % less. The concept of LCC is shown in Fig 1. The use of stainless steel reinforcement provides the following advantages. Depending on the stainless steel selected an almost identical match for coefficient of thermal expansion.